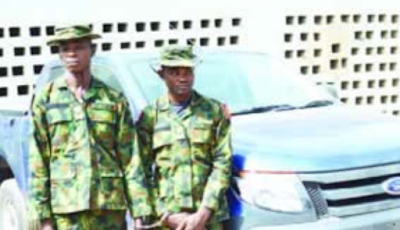 The police have nabbed two soldiers who deserted the army while attempting to cross the border to Republic of Niger in a stolen unregistered navy blue Ford pick-up truck. The suspects, identified as Abubakar Ibrahim and Jaduwa Thalma, were said to have deserted the military during an operation against the Boko Haram insurgents in Baga, Borno State. The Kano State police spokesman, DSP Musa Maijia, in a statement on Thursday, explained that the men were dressed in army camouflage when they were apprehended by the Special Anti-Robbery Squad personnel. The suspects, he said, allegedly attacked the vehicle owner in Port Harcourt, Rivers State, adding that through prompt information, they were arrested by SARS operatives from Kano and Katsina commands. Maijiya said, “During interrogation, the suspects confessed to be dismissed soldiers who deserted the service when they were posted to Baga on Operation Lafiya Dole and took to crime. The statement further said the Kano State Commissioner of Police, Rabi’u Yusuf, commended the SARS operatives for the successful operation, adding that the suspects would be charged to court as soon as investigation is completed.